Newly renovated Bethany Beach in-town gem... walk to the beach and downtown! Create your summer memories here! Villa Villekulla is fabulous gem of a rental on a nice quiet street. We are so excited to share updated photos soon of the new dining room addition. We've added an additional dining room (doubling the living room space) expanded one bedroom and doubled the deck area to give you even more room in this great family rental. Construction will be complete by March 1st and we'd love to have you spend your summer week with us! This lower level duplex is a wonderful, cozy family rental and it's never looked better! With a bright interior, granite countertops, woodflooring, along with a shaded back deck and great backyard...it's one of the nicest family rentals right in town. All the bedrooms have new carpeting and there is a TV in every bedroom as well as the family room. WiFi is available as well. Located on a quiet street, Villa Villekulla is a great family rental. 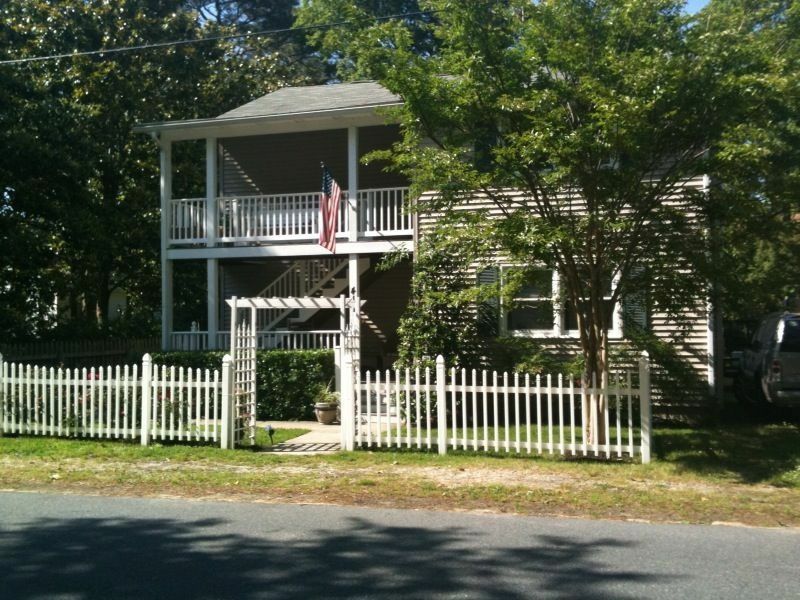 Just three and half blocks from the beach, one and half blocks from downtown Bethany Beach. It's an easy stroll, hop on the .25 cent . trolley which stops right in front of the house or grab the Villa Villekulla wagon for your little ones (or to carry your purchases home!) The newly expanded library is right around the corner and has great story hours and activities and a great playground is just over a block away. Spend your days at the beach and your evenings walking on the boardwalk, kite flying, or shopping in one of the many shops. Want to go out to dinner? No need to get into your car as Bethany has a number of restaurants including Mango's, Patsy's, Bethany Blues, Pie and the new Ropewalk. If you are looking for more evening entertainment Dewey, Rehobeth Beach and Ocean City are both minutes away. Outlet shopping (tax free) is just minutes away in Rehobeth. Collins is just a few blocks from the hustle of the boardwalk but is a nice quiet shady street. The best of both worlds! Our guests love hanging out in the hammock in the shady back yard, having breakfast on the back deck, walking to get the morning paper or an after dinner icecream or watching the sun rise from the boardwalk. Large dining table perfect for family meals..... or cards or puzzles. There are 4 televisions in the unit. One in the family room and one in each bedroom. (4) There is a flat screen in the family room and a TV in every bedroom. Plenty of board games and puzzles in the family room closet. Fenced in backyard complete with a hammock. Covered back deck with a large table perfect for outdoor dining! The house was very clean and tidy. Shortly after arriving Andrea introduced herself and offered to help with whatever trouble we had. The location is great and within walking distance to the beach. We had a fun week at Bethany Beach. The owners were helpful and the place was clean. We had great space for our family of 5 and hosted a few friends so having the back porch and grill was great. Other than some weirdly placed light switches and creaky beds, we enjoyed our stay and would recommend to other families! Makes for a very comfortable and easy beach vacation! Thanks for the use of beach chair and umbrella - a bonus for sure! My kids and I really enjoyed our time in this cozy first-floor home. The 3 bedrooms accommodated us well. My teenagers each had their own room, my son and I shared the 3rd bedroom, with twin beds. The teenagers shared a bathroom, and my son and I shared the other bathroom. I used the outdoor shower almost exclusively! The kitchen is nice, with granite counter-tops and an island large enough for at least two to eat comfortably at a time. The large dining table is a great place to spread out too. We stayed in one night because of rain and found the living room totally adequate with plenty to watch on cable, tons of games in the closet but we just chilled. The full-sized washer and dryer right off the kitchen was a great asset, as were the beach chairs! We did not hang outside much, but there's plenty of space out back if we'd wanted to. We rented bikes and rode to the beach every day and several evenings. The third bedroom would benefit from a ceiling fan. Really a nice spot. It is not "fancy" but it is very clean, updated, and charming. Very comfortable and casual. So glad you enjoyed your week at the beach! We look forward to the possibility of seeing you again next year! We had a wonderful time! Enough room for us each to have our own space. Walked to beach every day. Shopping in Lewes and kayaking in Fenwick. We will be back! I am so glad you had a fabulous week....would love to have you back next year! Our stay was very relaxing and enjoyable. We stayed for a week and felt very much at home. The house had all the comforts of home. The house was everything it was described to be located in a very quiet neighborhood. We played some yard games (we supplied) and used the grill out in the back yard. The boardwalk and beach were only a short 15 to 20 minute walk and if you didn't want to walk there was a trolly that ran every 20 minutes or so and picked and dropped you off in front of the house for a mere 25 cents one way. A full line grocery store was about a 10 minute drive away so we could make meals at the house. The owners Andrea and Jerry were very friendly and helpful. The boardwalk had some nice shops and very good restaurants. All in all it was a very good vacation and I would recommend this house to anyone who wants to go to Bethany Beach. We are glad you had such a great week....you were a fun group! Look forward to the possibility of seeing you next year! This is the perfect spot for a vacation at Bethany. It's within walking distance of town and beach and it's such a comfortable place to be--fully equipped with everything you could ever want. Wish we could have stayed longer. Owners are wonderful--always willing to respond if you have a question or concern.